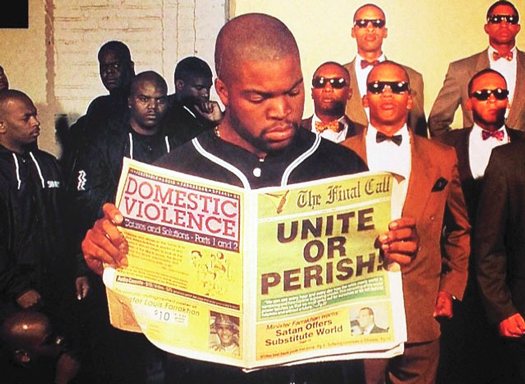 (FinalCall.com) - Many rappers and members of the Hip Hop Nation will readily admit that though they are not registered members of the Nation of Islam or self-identified members of the Five Percent Nation, they have been influenced by both in very significant ways. In Black communities, particularly major metropolitan areas, it is not unusual to hear the greetings of “As-Salaam Alaikum” coming from the mouths of little children, Christians, and many others who are not Muslims. 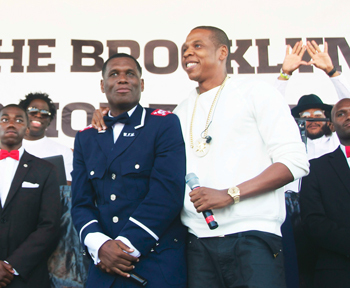 Jay Electronica and Jay-Z share a light moment during the festival. Within the culture of Hip Hop, you will hear many using the phrase “Word is Bond” who have never in their lives seen the Supreme Wisdom Lessons by Master W. Fard Muhammad, nor the 120 Lessons of the Five Percenters. But at the core of the culture are the teachings of the Nation of Islam, which center on the divine destiny of Black people to rise, the importance of knowledge of self, and the reality of God as manifested in men and women, not as a disembodied spirit. In fact, the fundamental teachings that a man, God himself, came to identify and deliver Black people in fulfillment of the prophecies, is at the root of any Black liberation theology being taught or heard today. Through his lectures and writings, the Most Honorable Elijah Muhammad shattered the myths of the White God, the White Jesus and White Supremacy cloaked in the religion of Christianity. It was the teachings of the Nation of Islam that brought Black people face to face with the fact that what they were reading in the pages of their Bibles represented prophecies that had yet to be fulfilled and symbolic pictures of people, places, and events in the future. The old gospel songs about Moses asking Pharaoh to “let my people go” and the deliverance of a suffering people seeking redemption are not Jewish melodies, but Black freedom songs, so it is fitting that Hip Hop would be the musical vehicle as modern day gospel songs to the youth, carrying forth these important truths and newly discovered realities. Black people were taught about the holocaust of European Jews, but nothing about their own Black Holocaust. Black people knew U.S. History, but very little about their history before slavery. All that would change with the injection of consciousness raising lyrics that would not only inform, but also educate. 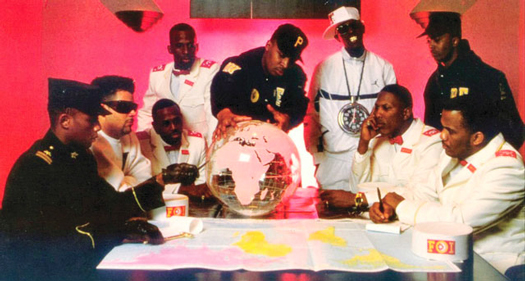 The lyrical content of Public Enemy’s Chuck D and the imagery of the Security of the First World (S1W) prompted many to look further into the Nation of Islam and to find out about Minister Farrakhan. The founder of the Five Percenters (a.k.a. 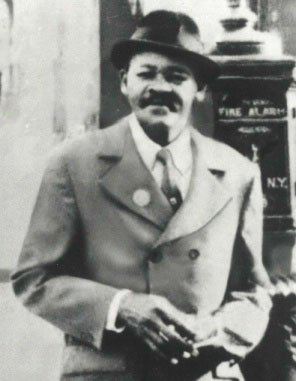 the Nation of Gods and Earths) was Clarence 13X Smith, a former member of the Nation of Islam’s Temple No. 7 who is credited with taking the teachings and Supreme Wisdom to young people in New York. For many, during the late 1980s and mid-1990s, their first exposure to the voice of the Honorable Minister Louis Farrakhan was hearing his speeches mixed over beats, or perhaps a reference in a Hip Hop song. “I’m very appreciative of just that one lyric, that particular lyric,” Wise Intelligent noted. Seeing Jay Electronica at the 2014 Brooklyn Hip Hop Festival in full Fruit of Islam uniform took many back to a time when it was not uncommon to hear consciousness raising lyrics coming from the most prominent and popular rappers. It was a major demonstration of the potential and the future of Hip Hop and it was a major public representation of Islam, said Dr. Wesley Muhammad, who has been a close friend and confidante of Jay Electronica’s for many years and was intricately involved in the planning and execution of his July 12 performance surrounded by the Allah Team, Lions Out the Cage and members of the Fruit of Islam from Muhammad’s Mosque No.7 and 7C. “We can’t deny the fact that Hip Hoppers, rappers, are the gods of the Black community,” said Dr. Muhammad. “A god is a being of power and force. There is no other element in the Black community that has the power to shape and direct Black culture—and through that Black life— like the rappers do,” Dr. Muhammad added. “Life for a large segment of Black people revolves around the dictation of rappers,” said Dr. Muhammad. “There is no other element in our community that has that power—not sports figures, none of our religious figures—no one does. And only a God can make a god. I have to assume that the Hip Hoppers have that power by Allah’s permission, which suggests that Allah has deep interest in using the Hip Hop community and what I think what happened in Brooklyn signals to the world that Allah is ready to take control of this powerful artistic expression,” he said. It is for that very reason Lord Jamar of the legendary group Brand Nubian feels having Hip Hop mogul Jay Z present and performing with Jay Electronica with the F.O.I was very important. Lord Jamar has been outspokenly critical of Hip Hop’s direction with the feminization of the Black male and turn towards crime, violence, materialism and commercialism. Instead of rappers using their influence to endorse enlightening books, or to discuss historical figures, many have used their popularity to promote self-destructive lifestyles and excessive narcotic and alcohol use. Lord Jamar described what took place at the festival as “a beautiful day” for the Hip Hop Nation. “That type of energy I definitely haven’t seen or felt in quite a long time especially surrounding Hip Hop. To have the brother Jay Electronica to come there with the F.O.I. dressed in full F.O.I. garb was a strong statement to make today in Hip Hop. 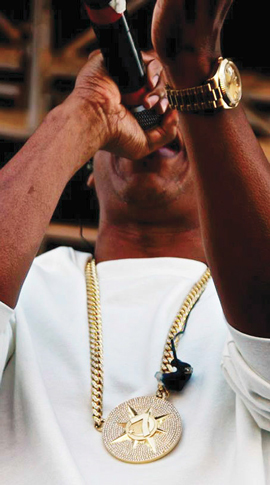 Then to receive the chain from Jay Z that has the Universal Flag on it and to be wearing that in conjunction with the F.O.I. uniform, I thought was a very strong statement because both those ciphers are inextricably intertwined and to see that psychological display of unity I think was beautiful, especially at a time in Hip Hop— and in music in general—where finding something positive is almost non-existent,” he added. Lord Jamar’s “The 5% Album” and The Poor Righteous Teachers album “Pure Poverty”. 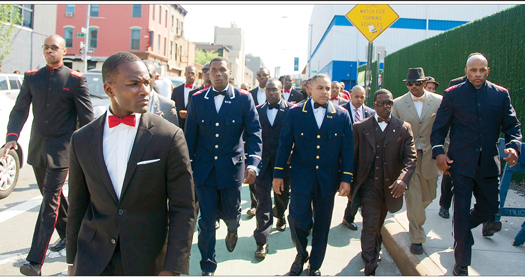 As recently as two months ago, Minister Farrakhan through a post via Facebook shared his feelings about the Jay Electronica/Jay Z collaboration titled “We Made It” which contained numerous references to the doctrinal foundation and lessons of the Nation of Islam. “I am grateful to Allah (God) for the greatness of Jay Z and Jay Electronica, who could take the wisdom of the Honorable Elijah Muhammad, or the wisdom of Brother Clarence 13X, who is really the father of The Five Percent Nation, and use that wisdom in a song. And just as we can be inspired by words to do bad things, we can be inspired by words to do great things! I hope that this is the beginning of these great rappers taking their role as not just rappers, but enlighteners of the vast audience that is theirs. And from that enlightenment, produce a world where human beings, regardless of race or creed or color, can live together in peace and harmony. Best wishes to Jay Z and Jay Electronica, and all our great emcees. Continue The Good Work of feeding the flock,” Min. Farrakhan wrote. On numerous occasions the Minister has spoken of the potential power of rightly guided Hip Hop artists to guide the world’s youth toward liberation. Minister Farrakhan held an East Coast Hip Hop Summit in New York in 2001, a West Coast Hip Hop Summit in Los Angeles in 2002, and a large gathering of the South’s Hip Hop artists at Atlanta’s Justin’s Restaurant which at that time was owned by P-Diddy, in 2007. Eric B. 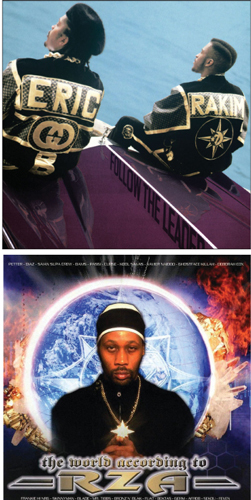 & Rakim’s “Follow the Leader” with Rakim’s custom made coat displaying the Universal Flag of the Five Percenters (Nation of the Gods and Earths) and Wu Tang Clan’s RZA wearing a Universal Flag medallion. In 2003, the Minister sat down for a discussion with Ja Rule to squash the beef between he and rapper 50 Cent. In 2008, Nas made an song that was originally titled “Louis Farrakhan.” In late 2013, artist Kanye West found himself embroiled in a controversy with the Anti-Defamation League of B’nai B’rith. After receiving strong backing and counsel from Minister Farrakhan, Kanye withstood the Jewish onslaught and refused to bow. Popular rapper Rick Ross not only met with Minister Farrakhan, he also posted a photo letting the world know of his respect for the Minister. In his book “Decoded” Jay Z mentions Minister Farrakhan in explaining lyrics to one of his songs, and has a picture of him in it. Members of the Wu Tang Clan have met with the Minister numerous times, and the RZA frequently attends the NOI’s annual Saviours’ Day convention. Although Minister Farrakhan himself has remained connected to many of the industry’s leading Hip Hop artists, that direct connection has not been maintained on “the street level” and as a result, the culture and lyrical content has suffered, according to Dr. Muhammad. While the public display was met with cheers, Wise Intelligent said it was “disheartening” to hear criticism coming from some. “We understand the difference between peacocking and a show of power, those necessary displays of power that galvanize the people’s potential and draws them close to the reality and an understanding of organizational strength,” said Wise Intelligent. It was a display of unity and goodwill, not just from the standpoint of seeing the Nation of Islam and Five Percenters together, but it was an important thing for Black young people to see, he added. Instead of rap crews being named after criminal organizations, or united by illicit activities and negativity, the pendulum may be swinging in the direction of positive energy with references to kings and queens, with mind elevating lyrics. It remains to be seen if this will continue, said Lord Jamar, who has always used his popularity and platform to spread knowledge. “I come from an era where the elders they would pull your coat so to speak, when you were doing something wrong, and it wouldn’t be in a hateful way, it would be like ‘hey brother, you need to do the knowledge to what you’re doing right now because you’re bumming out right now, you’re moving fast and this is what can happen’ and it was out of love,” said Lord Jamar. Wise Intelligent sees promise in the unity and uplifting lyrical content of artists affiliated with Atlanta’s God-Hop movement originated by Sol Messiah and headlined by the brilliantly creative emcee Sa-Roc. Artists like Jasiri X, Dead Prez, Immortal Technique, Black Collar Biz, Tahir RBG and Narubi Selah consistently deliver thought provoking, “politically oriented content” to counter the formulaic, oft-times vulgar and repetitive gibberish played on the radio, he said. It may look like consciousness raising rappers disappeared, but they have not, he added. For his video for the song “Illuminati,” Wise Intelligent had members of the F.O.I. from Trenton shown, as well as the Cycle Kings, a legendary Black motorcycle club, members of the RBG movement and Black Panthers to show a united front.